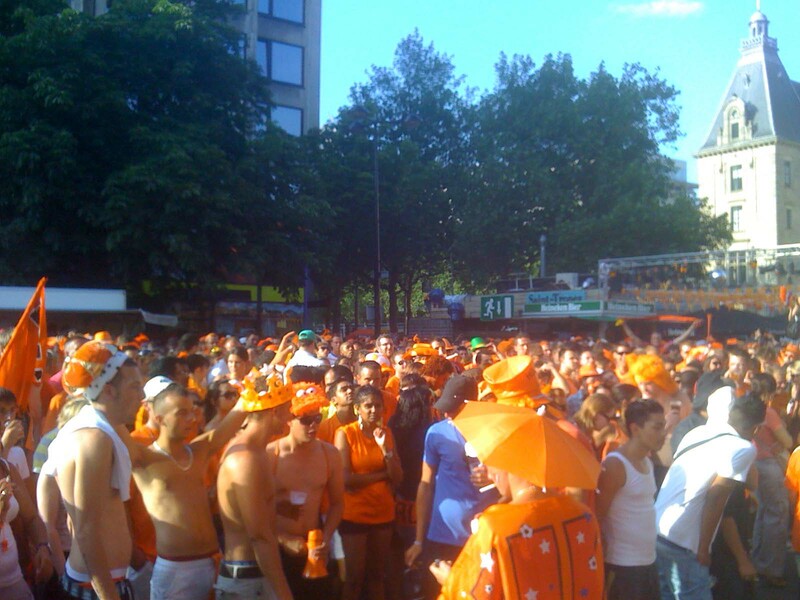 Shortly after my arrival in Rotterdam last Sunday, the final game of the World Cup began. Though I am a soccer (and football) fan, I must confess that the trip was planned long before the Dutch secured a spot in the final. Arriving in the Netherlands after traveling for nearly 24 hours, I was looking forward to a quick nap before exploring the city. No rest for the weary. The party was already starting and people were collecting in a street near the Stadhuis, a mere block or two away from my hotel. Music was blaring from a rather impressive sound system and cold beer was flowing from the tap. How could I resist? Forget the nap, I'm going in! The Sea of Orange (Zee van Oranje) was lively and exciting. I wandered through the streets and people seemed to be coming from every direction, flowing towards their favorite spot to watch the game. I grabbed a quick dinner from Dino's, a local restaurant, just before they closed to enjoy the festivities as the pregame broadcast started. Everyone seemed to be in high spirits, demonstrating their national pride. That is when I got arrested. The officer picked me right out of the crowd. Clearly, I must have looked like a criminal? I immediately wondered if they have racial profiling training, like the 'zonies. The officer stopped me and asked a question, in Dutch, of course. Whazzat? I don't speak Dutch, or at least not in any way recognizable by someone who is actually fluent in Dutch. Egads, I had only been in the country for a few hours and already I'm embroiled in an international incident. Episodes from Locked up Abroad came flooding into my mind. I had a vision of a tombstone engraved with "What was he thinking?" Without missing a beat, the officer switched to English. "I am from the Orange Police, and I see that you are not wearing Orange." The officer was quite right. I did not have anything Orange. My last Orange T-shirt was added to the rag pile just a few short months ago. I knew was in big trouble -- time to act like a dumb American. The setup: "I just arrived in the country..."
The excuse: "... and I have been trying to find a store to buy something Orange." The saving grace: "Uh, and if you know of a store where I could find such things, I would promptly rehabilitate myself." I managed a smile, in a hopeful attempt at leniency. "Oh, well all of the stores are closed at 5 PM..."
Whoa! This might actually be working. "... you will have to wait until later." "Meanwhile, get a beer and enjoy the game." Free at last! Free at last! I had successfully negotiated my way out of jail in a foreign land, and the beer was very tasty, too! The result of the game put a damper on the celebrations. Spain scored an impressive goal with just a few minutes before the end of overtime. The streets cleared and the city returned to normal. A national week of celebration was replaced with a warm homecoming for the National Team in Amsterdam. My newfound friends in Rotterdam were a pleasure and I am truly grateful for being a part of the festivities. As for the Orange Police, I have learned my lesson and will never again transgress.